The start of something big – let the world know! Choose this italics style with baby’s birth year customised in your choice of text colour. Our personalised bibs are printed to order. Select your preferred fabric colour, and then choose your text and text colour. Choose from nine fabric colours and 27 text options! Our bandana bibs look great and are super absorbent. Material is 100% cotton with polyester fleece back. 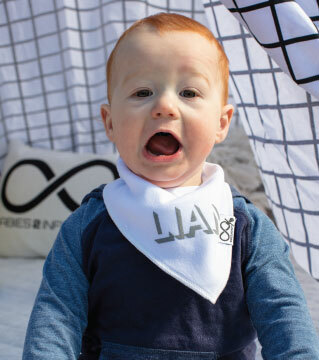 Multiple clasps make the bib adjustable to suit your baby. Bibs fabric may fade from sun exposure. This is not considered to be a flaw.